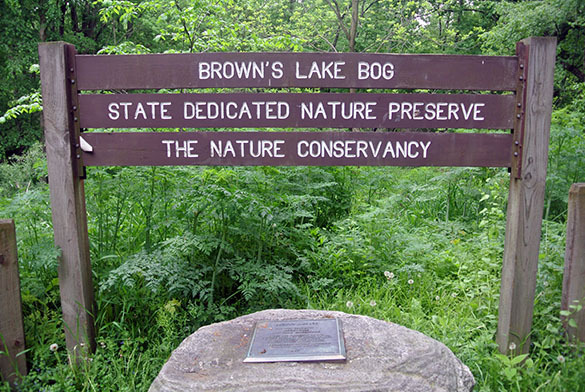 I was privileged today to visit Brown’s Lake Bog, a Nature Conservancy preserve, with Greg Wiles, Nick Wiesenberg, and Kim Carter (Chemistry ’16). Greg and Nick have been here many times with students and colleagues, including some epic sessions of ice drilling. It is an important site for both the rare plants that live here and the geological context of a relict kame-and-kettle topography from the last glaciation. 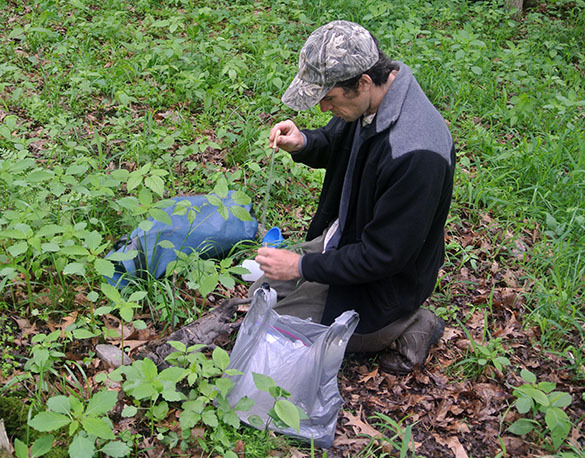 Greg has set up over the years a series of shallow well measuring stations and has cored several of the old-growth oaks for tree-ring analyses. Kim, a student of Paul Edmiston, was looking for sites to place Osorb samples to adsorb various chemicals in run-off waters. I was along just for fun. 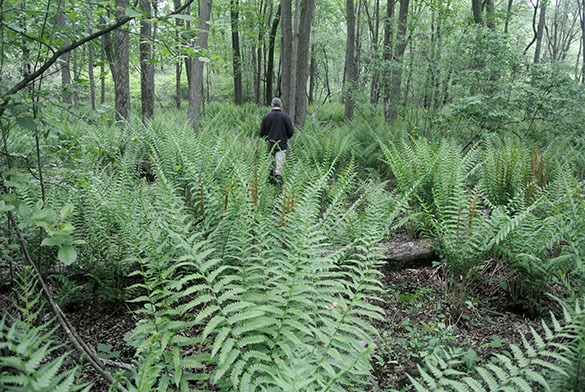 The Nature Conservancy maintains the 80-acre site, including trails and a boardwalk through the woods to the bog itself. Near the head of the bog trail is a nice view of a plowed kame. This is a geomorphological feature formed when sediment accumulated in a depression on a glacial ice sheet and then was deposited as the ice melted. The bog itself is a kettle, the result of a melting block of ice buried in the sediment produced at the margin of a retreating glacier. 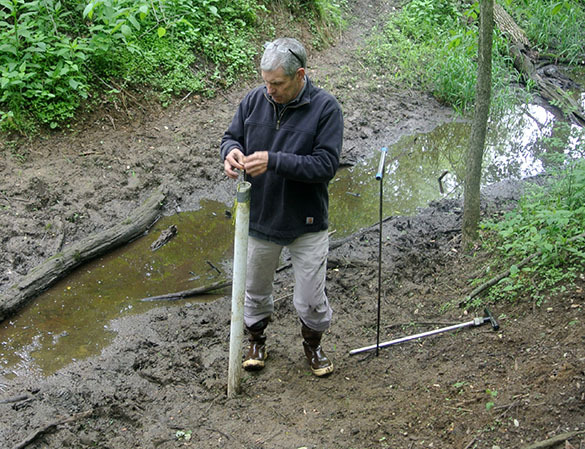 Greg retrieving a transducer, which measures water level changes, from one of his wells. Nick is here recovering a rainwater sample from a collector. This water is isotopically examined by researchers at the University of Cincinnati as part of a long-term project. 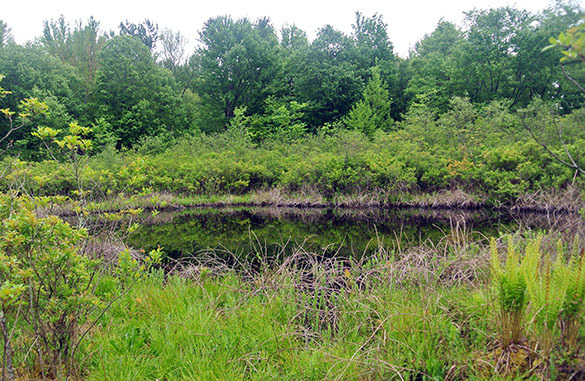 Here is the beautiful bog itself, slowly being filled by sediment and encroaching shrubbery. The water is surrounded by a thick floating mat of Sphagnum moss. The Sphagnum mat supports a fascinating array of rare plants. 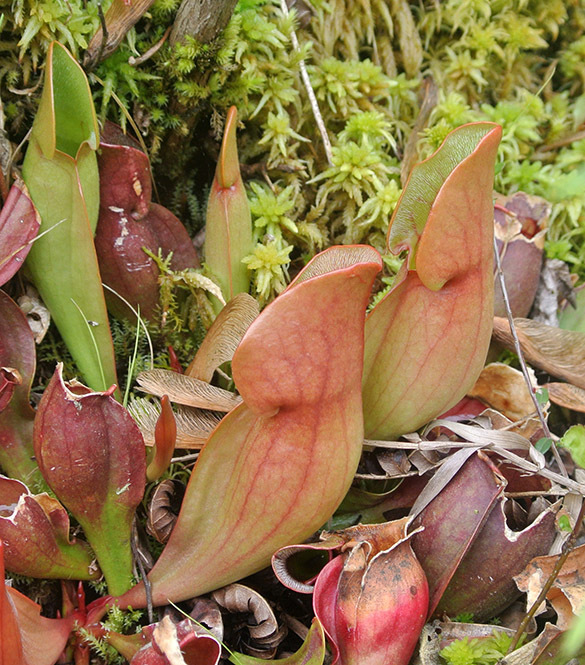 It is an acidic, nutrient-poor environment, so the plants are quite specialized. 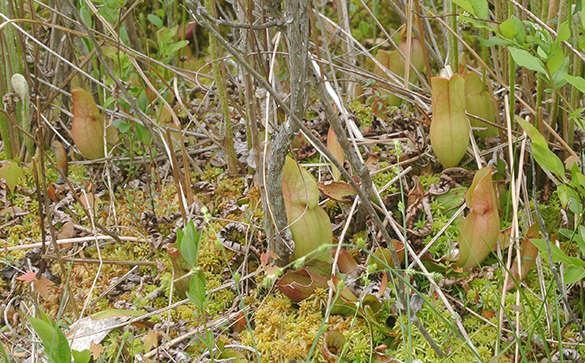 The stars of the boggy botanical delights are the Northern Pitcher Plants (Sarracenia purpurea). These trap insects inside their fluid-filled cavities surrounded by slippery walls. That is how they obtain most of their nutrients. 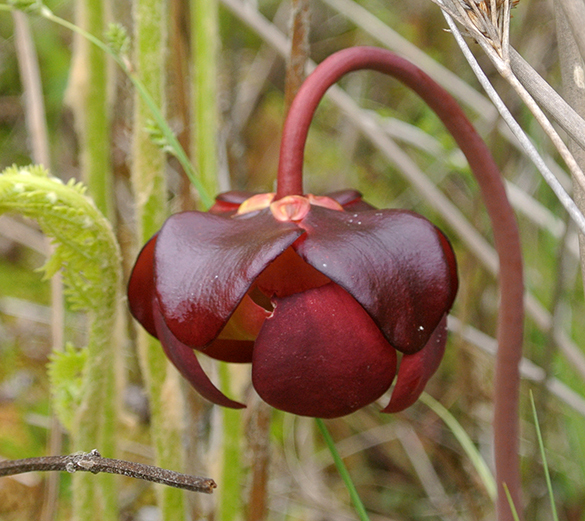 These tall, downward-facing blooms are the flowers of the pitcher plants. I imagine they are high above the pitchers so the pollinating insects don’t get eaten! 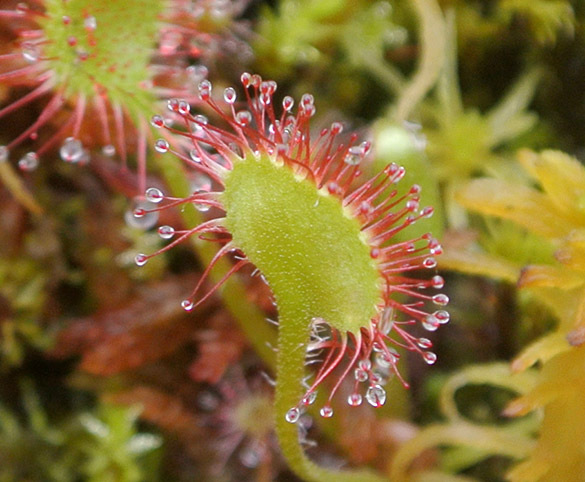 Finally, here’s a nice Round-Leaved Sundew (Drosera rotundifolia), another cool carnivorous plant common on the Sphagnum mat. What a delightful day with my colleagues!